Some of those were ghosts for sure. I don't know about a few of them but the rest have me convinced. This photo from Reddit’s /r/Ghosts was taken during a ghost tour in The Rocks, Sydney. What do you make of the figure next to the woman? Is it a spirit or something more easily explained? Have a creepy image to share? Send it to ghostsghoul@gmail.com. What's that big gray thing to the left? It looks like it has eyes...or maybe it's some guy sitting down, But why is he glowing? It looks like another child standing on the steps Casper. I can see it but the bottom of the figure is too hazy. You could barely see the ghost girl. That crazy guy with the camera wouldn't hold it still. I think it could have just been somebody walking by wearing a dress. It is said that a picture is worth a thousand words, and I suppose there was a time when that was true, but in this day and age, photos are often only worth the effort someone put in to touch them up and alter them. With the dawn of digital photography and digital manipulation such as Photoshop, you never really are sure what you are looking at. Our technology has allowed us to show whatever we want in a photograph, to mislead and deceive, and whereas once a photo could be used as evidence of something real this has certainly changed with the evolution of technology. 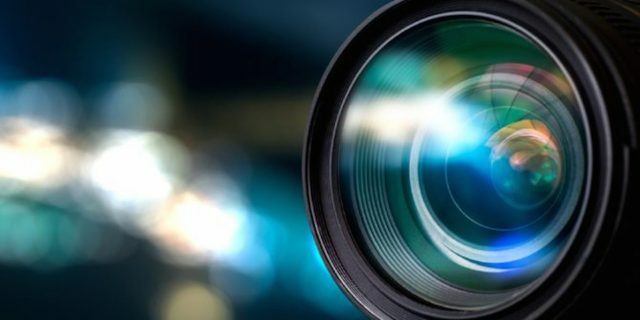 This can certainly be felt in the world of the paranormal, where the ubiquitous presence of photo trickery has made photographs of little use at all, with cries of “fake” or “photoshop” immediate, and no one sure whether to believe what they see anymore. Yet there was a time when pictures were captured on real film, with negatives that could be examined, and there was no CGI to muddy the waters, when a photograph could be reasonably relied upon to be an accurate representation of what it showed. Here we look at some of the most famous photographs of the paranormal from this golden era before Photoshop and CG manipulation, to a time when photographs could still be mysterious. Also related to the war is a photo that begins with the tale of two seamen named James Courtney and Michael Meehan, who served as crew members aboard the S.S. Watertown. In December of 1924 they tragically died while cleaning a cargo tank, when there was a gas leak and they were overcome by the lethal fumes. They were given an hoannable burial at sea, but this was not the last anyone would see of them. In the following days many of the crew aboard the ship and even the captain himself saw the ghostly faces of the dead men hovering under the waves. On one occasion the faces were so clear and distinct that a photograph was taken of them, and although it could be just an illusion there seems to be two very clear human faces visible in the photograph. The photograph was found to not have been tampered with in anyway, so what are we looking at here? A rather creepy and perhaps lesser known photograph of an alleged ghost was taken at a cemetery in 1947 by a Mrs. Andrews. The woman had been taking a picture of the grave of her dead daughter, no one else had been there, yet when the film was developed there appeared what looks like a spectral child sitting atop the grave. Making it even spookier is that Mrs. Andrews claimed that the figure was not her daughter, and in fact no one she recognized at all, meaning that if it is indeed a ghost, then it was that of an unidentified child from one of the nearby graves. 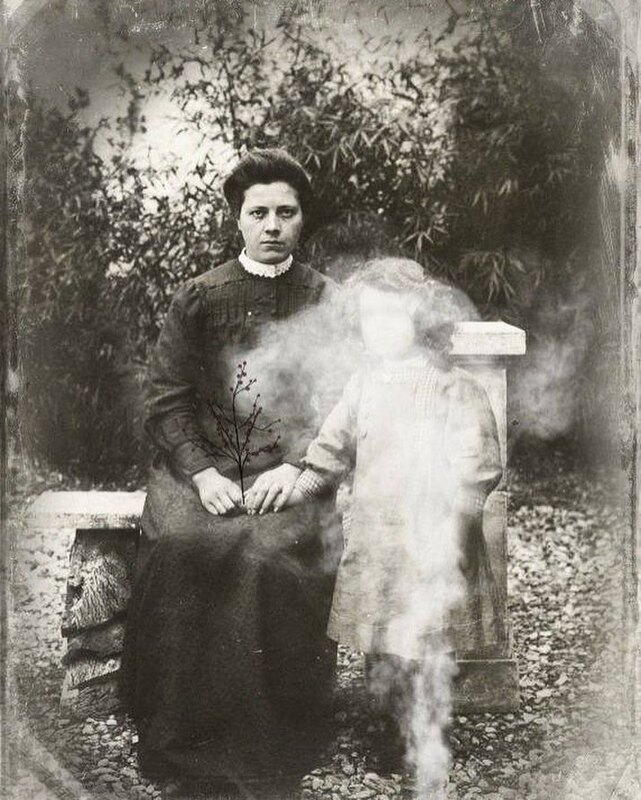 The child in the photo was never identified, and it remains a rather unsettling photograph, ghost or not. From the 1950s comes another quite widely known supposed ghost photo, allegedly taken at the Texas home of the Cooper family on the day they moved in. On this day, Mrs Cooper, grandma Cooper and both children had a family photograph taken with them sitting around a table. At the time it was just a normal family portrait, and there was really nothing odd about it at all, but the family was shocked when the film was developed and seemed to show a spectral form seemingly falling down from the ceiling above as if hanging by its legs. The photograph has been open to much criticism since it was first made public in 2009, with theories including that it is actually a modern clever fake, or that it was actually the ghost of a previous owner. Another idea is that it is simply an example of an anomalous looking double exposure, but the debate rages on, and it has become one of the most well known ghost photos despite the questions swirling behind its authenticity. Besides UFOs themselves, there is also a well-known photo of the survivor of a supposed UFO attack. In 1967, Stefan Michalak was out at Falcon Lake, in Canada, when he claimed he had come across a UFO landed in the woods, which he approached only to be knocked down and badly burned in a strange pattern when it shot off into the sky. He would be hospitalized and exhibit symptoms consistent with radiation poison, and the source of the burns could never be determined. The photo shows Michalak in bed with his unidentified burns and injuries. Even more outlandish than any of these photos so far is one which was for years buried away within the archives of NASA photos. In this case the photograph in question is from the Apollo 17 moon landings in 1972, when astronauts Eugene A. Cernan, Harrison H. Schmitt and Ronald E. Evans carried out their mission on the surface with the aid of a rover near a place called Geophone Rock. They took numerous photos of the moon’s surface during their dangerous mission, and this particular photo was written off as an overexposed “blank” at the time, as it seemed to show nothing but a solid background. Yet some curious photo enthusiasts cleared up the contrast and found that in reality the photo seems to show what looks like a pyramid structure. This was immediately jumped on by some in the UFO community as proof of aliens on the moon, but the photograph has been subject to much scrutiny, and accused of being simply an overexposed accidental shot of the rover itself, a compelling argument for which can be read here. Whatever it is at least looks weird nevertheless.